More data on IPO and founders. Following a recent post on the age of founders, I just did a more systematic analysis on the topic and at the same time analyzed more elements on the cap. table of many companies. I had 47 companies in my previous post. Here I just have 100! 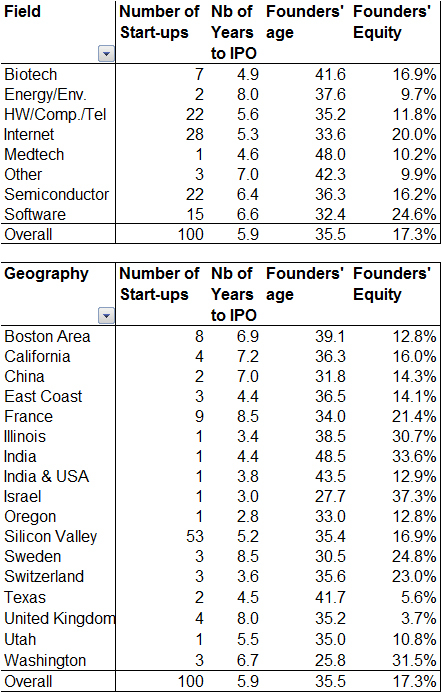 The two tables give the founders’ age, the number of years from foundation to IPO and the founders’ remaining equity at IPO by field and geography. – Founders do not always share equally the initial stake. – There is no real definition of founders but the group of people who recognize themselves as such. – ESOP reserved for future grants is a quite artificial part of the overall picture. – When age was not available, a indirect measure was to consider a BS is obtained at age 22. – Directors include independant directors only, not the investors. 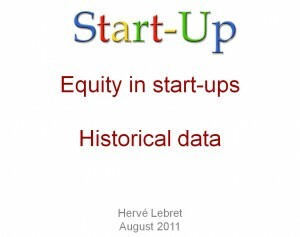 This entry was posted in Start-up data and tagged Age, Equity, Founder, IPO on August 15, 2011 by Hervé Lebret.